Research!America’s chair, The Honorable John Edward Porter, has been named the 2014 winner of the Public Welfare Medal, given by the National Academy of Sciences. 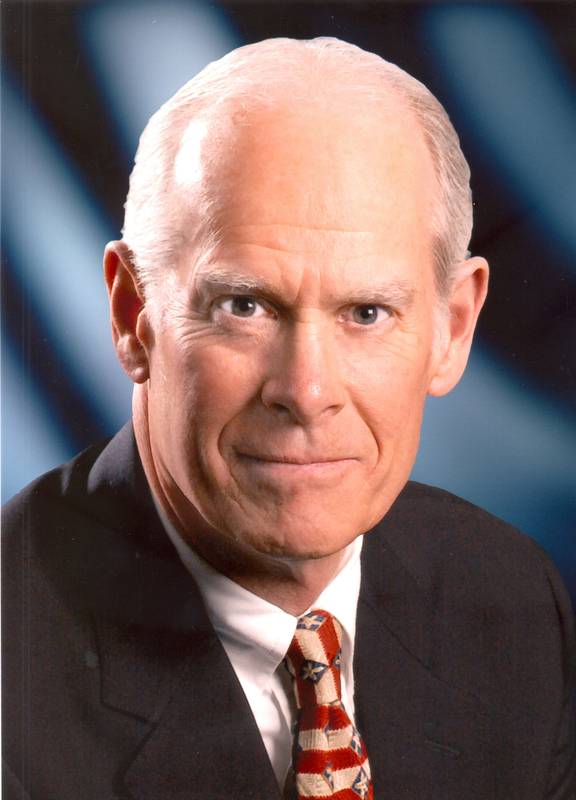 The award recognizes Porter’s decades of advocacy on behalf of scientific and medical research. Established in 1914, the Public Welfare Medal is the most prestigious award given by the Academy. The Public Welfare Medal will be presented to Porter on April 27 during the Academy’s 151st annual meeting at the National Academy of Sciences Building, 2101 Constitution Ave. NW, Washington, DC. More information, including a list of past recipients, is available at www.nasonline.org/public-welfare-medal. 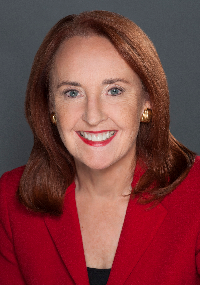 A Weekly Advocacy Message from Mary Woolley: Are you satisfied with the State of the Union? As the year comes to an end, let’s revisit the top ten most popular Research!America blog posts in 2013 (based on page views) that highlighted the importance of making research for health a higher national priority. We’re thankful for our many outstanding guest bloggers including early career scientists, leaders of industry, academia, patient groups and scientific societies who strongly believe in the promise of scientific discovery and medical innovation to build healthier lives. August 14: Guest blog post by Tyler Wiechman on why the millennial generation is leaving science, from his personal experience. “If funding was more available for these VITAL research programs, students of this generation would be much more optimistic about their personal future in clinical research and able to get into academia or the industry of their choice.” Read the post, here. July 22: The Science Policy Group at UCSF speaks out about the “crisis situation” brought about by the sequester. “We have observed a number of our postdoctoral colleagues leave UCSF due to the budgetary constraints both they and their PIs were experiencing. The immediate consequences, such as sudden lay-offs and premature termination of promising research careers, are obviously tragic.” Read the post, here. May 17: Neglected tropical diseases (NTDs) commonly associated with the developing world, have been identified in many parts of the country including Louisiana. Research!America hosted an NTDs event at the Tulane University School of Public Health and Tropical Medicine in New Orleans with health and policy experts. Read highlights of the event, here. September 19: Highlights of the inaugural Advocacy Academy which brought 12 postdoctoral researchers from across the U.S. for a two-day advocacy training program in Washington, D.C. that culminated in Capitol Hill visits with their representatives. Read the post (and see photos), here. November 6: Every year, Research!America and other leading health organizations take time to recognize the public health professionals across the country who protect us from disease and injury. The 2013 Public Health Thank You Day blog post describes the round-the-clock activities to address major health threats and promote good health. Learn more about the initiative, here. April 24: Research!America produced two short compelling videos about neglected tropical diseases and patients with NTDs that were unveiled at the NTDs Louisiana event (see post #8). Watch the videos, here. May 30: Blog post about a McKinsey Global Institute’s report that identified 12 “disruptive technologies” that could be transformative for the U.S. economy. “It doesn’t take much imagination to see many of these technologies making an indelible mark on health care and public health.” Sound interesting? Read the post, here. June 4: The third most popular post of 2013 was the announcement of the Research!America’s Inaugural Advocacy Academy which focused on engaging early-career scientists in research advocacy and science policy. The program is an opportunity for postdoctoral fellows to learn how to incorporate advocacy and effective communications into their role as a scientist. (see post #7). Take a look, here. July 25: The second most viewed; op-ed by Abigail Schindler, PhD, postdoctoral fellow at the University of Washington, Department of Psychiatry and Behavioral Sciences and co-leader of the Seattle Forum on Science Ethics and Policy published in The Seattle Times. Abigail bemoaned the consequences of sequestration (across-the-board budgets cuts) to science and the careers of young scientists. Read more here. October 23: Our most popular post of the year! 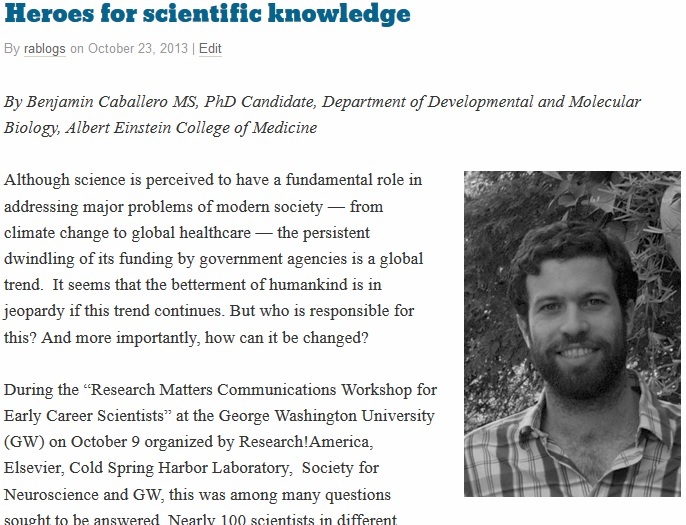 Benjamin Caballero MS, a PhD candidate at the Albert Einstein College of Medicine (one of the Research Matters Communications Workshop participants) wrote this entry about the importance of scientists communicating their research to the public and policy makers. New National Poll Reveals Many Respondents Predict China will Surpass U.S.
ALEXANDRIA, Va.—December 3, 2013—Nearly two-thirds (65%) of Americans say it’s likely there will be another government shutdown in the months ahead as Congress continues to debate deficit and budget issues, according to a new national public opinion poll commissioned by Research!America and the American Society of Hematology. This sentiment is shared across party affiliations: Democrats (66%), Republicans (65%) and Independents (65%). There is also consensus across party lines that government dysfunction has consequences. A majority of Americans (57%) say the shutdown in October caused significant harm to many government-funded programs including medical research, defense and education. Democrats (68%) and about half of Republicans (49%) and Independents (51%) agree. On the topic of sequestration, a plurality (44%) says Congress must tackle tax and entitlement reform to reduce the deficit instead of continuing the 10 years of across-the-board cuts; another 16% say sequestration is not the right way to reduce the deficit. Less than a quarter (23%) believe the across-the-board cuts are a way of ensuring that many government programs share the pain, and 17% say they’re not sure. In general, 62% of Americans say they’re concerned about the long-term effects of sequestration on advances in health care such as the development of new drugs and other treatments. Letter to the editor by Research!America President and CEO Mary Woolley published in the Philadelphia Inquirer. By visiting a University of Pennsylvania research facility last week, Sen. Bob Casey (D., Pa.) underscored his commitment to making research and innovation an immutable national priority (“Scientists reeling from budget cuts,” Oct. 24). Adequately supported, research will allow us to overcome major health threats and drive the economy. Americans have taken notice that research support is waning and, in addition, say they are concerned that officials in Washington are not paying enough attention to deadly diseases, polling done for our nonprofit advocacy alliance, Research!America, shows. If elected officials aren’t paying attention, who will lead the charge to assure robust funding for research now and in the future? Too many lives hang in the balance if we take medical progress for granted. Cures and treatments for deadly and disabling diseases can’t wait out nine more years of sequestration.